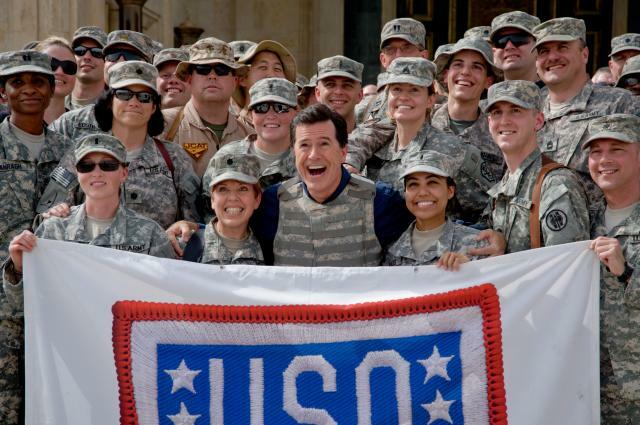 Stephen Colbert, seen here posing with service members in Baghdad in 2009, is bringing is comedy to a decommissioned Navy carrier. Comedy Central funny-man Stephen Colbert will host his second annual music fest aboard decommissioned carrier and military museum Intrepid. StePhest Colbchella ‘012: RocktAugustFest will take place August 10 on the Hudson River in New York, Digital Spy reported. Flaming Lips, Grandmaster Flash, Santigold, Grizzly Bear and fun. are expected to perform. “We are gonna rock the boat, which won’t be easy because the Intrepid displaces 41,434 tons,” Cobert joked about the event, according to Digital Spy. “Does Bonnaroo have cruise missiles? I think not!” he added. If you can’t make it, you can see performances and interviews from the gala on Colbert Report the week of August 13, Monday through Thursday nights at 11:30 on Comedy Central.